This set of Tiffany dishes was attractively displayed prior to the live auction. My clients procure some excellent live auction items. Each year I whittle down my favorites and list them in my Auction Item Guide™. But every so often, I have to sell an item that isn’t strong by benefit auction standards. A trip to a luxurious resort in a dangerous country. A set of Oneida dishes. With a dining room table. Dishes are so personal; the style you like might make me grimace. How can you possibly pick a pattern that lots of people will find appealing? Even though I’m not fond of selling dishes in a live auction, this nonprofit did two things really well. 1. The dishes were from Tiffany. If you’re going to sell an item whereby much of the value is based on personal taste, at least opt to sell a respected brand. Some will bid on it because of the brand. 2. The live auction item display was attractive. Though the committee could have taken all of the pieces out of the boxes and displayed them on a table, this is just as effective. They displayed a few pieces to show the Audubon pattern. 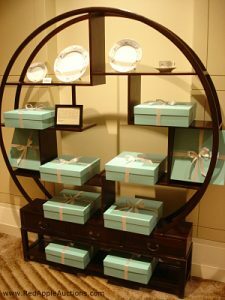 Other dish sets were left wrapped in Tiffany’s signature aqua blue box. I also liked the circular display cabinet, which was supplied by the hotel. This item wasn’t the skunk of the auction, but it also wasn’t the highlight. This china service for 10 was valued at $3000 and sold for $3250 in one of my 2008 auctions.